Mr Cameron, 43, becomes the youngest premier since Lord Liverpool almost 200 years ago, and the first Conservative in No 10 since John Major departed 13 years ago. He promised there would be “hard and difficult work” ahead and said his administration would focus on “rebuilding family, rebuilding community, above all, rebuilding responsibility in our country”. 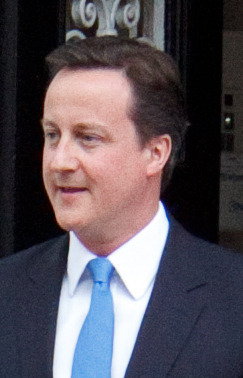 David Cameron has entered 10 Downing Street as prime minister, returning the Conservative party to power after 13 years. 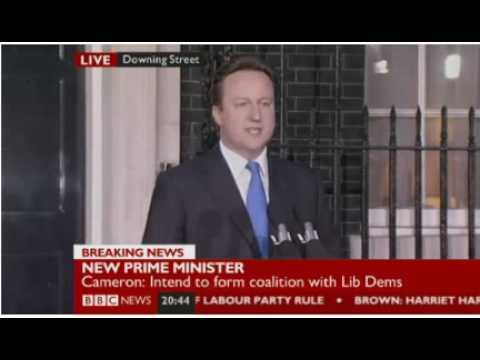 Cameron accepted the Queen's invitation to form a new government shortly before 8.30pm and minutes later spoke to the country outside Downing Street alongside his wife, Samantha, and announced he will establish a "proper and full" coalition with the Liberal Democrats - the first in British politics since 1945. LONDON -- Conservative leader David Cameron walked into No. 10 Downing Street on Tuesday night as Britain's new prime minister, ending five days of political limbo and 13 years of Labor Party rule after forging a historic coalition that spans the country's political spectrum. The deal that brought Cameron to power in the wake of indecisive elections last week united the Conservatives and the Liberal Democrats in Britain's first coalition government since Winston Churchill's war cabinet in the 1940s. The unlikely marriage of the center-right and center-left parties, with divergent stances on such major issues as national security and immigration, led some analysts to question its durability. But after exchanging major concessions in the name of forming a "strong and stable government," the two parties were set for their first joint cabinet meeting Wednesday.